Ahead of 2019 Imo gubernatorial elections, the Deputy Governor of the State, Prince Eze Madumere has continued to receive commendations and endorsements from eminent personalities and groups in recognition of his commitment to service. Joining other patriotic Nigerians, the South East Actors Guild of Nigeria, yesterday, led by its Zonal President, Mr. Ikechukwu Ezenagu esq. honoured Prince as the best Deputy Governor in the South East. Presenting the certificate and plaque of honour to Prince Eze Madumere at the government house, Owerri during a solidarity visit, the leader of the group, Barr Ikechukwu Ezenagu said the award of honour as the best Deputy Governor in the South East is borne out of his humility, diligence, proven capacity, support to the success of Owelle Rochas Okorocha led administration and contributions towards the uplift of the people of Imo State and beyond. He described the number two citizen of the State as the man of the people considering his open mind, accommodating spirit, accessibility and care for the success of others. Ezenagu while commending the Deputy Governor for his numerous outstanding awards stressed that the recent one from the Actors is exceptional for their closeness to the people in the corridors of power. Acknowledging the excellent and proactive administrative prowess of the Deputy Governor, he said; “We have known you from your Chief of Staff days. At every point in time we knocked at your door, you have always embraced us and helped us out in whatever may be our challenges. We have also followed your rising profile, contributions and support to your Principal, Owelle Rochas Okorocha to make life better for your people, yet none of these changed your personality. We hereby recommend that you are the most suitable to succeed Governor Okorocha come 2019. We are ready to give you our votes. Responding, the Deputy Governor thanked leaders and members of South –East Actors Guild of Nigeria for the honour, as he dedicated the award to Governor Rochas Okorocha and the people of the State. Describing the honour as a precious gold, Madumere reiterated that he is an astute administrator and not among the politicians known for their dangerous intrigues, pointing out that his name is synonymous with service. He remarked that nobody is born a politician as he urged politicians to see themselves as servants of the people. ‘’Nobody is born a politician. Politicians must be servants of the people. I see myself as an administrator. My desire is to be the greatest administrator who would be remembered for impacting positively to the development of the State and more importantly to the people‘’, Madumere maintained. Prince Madumere commended the Actors Guild for putting Nigeria in the global map, describing the profession as a noble one. Some of the Actors present at the visit included Fabian Adigwe, Chinwe Owoh, Chibueze Umez and all the Chairmen of all the Actors Guild in the South–East. 1. 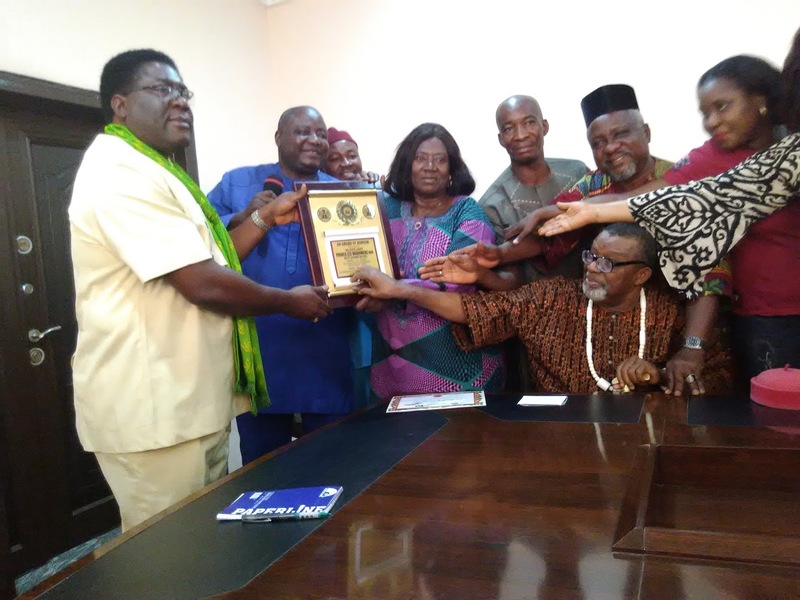 Imo Deputy Governor, Prince Eze Madumere receiving award of Excellence and plaque as the Best Deputy Governor South East from Actors Guild of Nigerian (AGN), led by its Zonal President, Mr. Ikechukwu Ezenagu esq. at the office of the Deputy Governor when they paid him a Solidarity visit.